Puffing is a hydrothermal process. 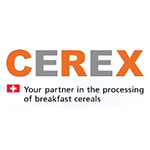 The CEREX puffing process with its patented subsystems fulfils all the requirements for a controllable, industrial scale system for the puffing of all types of cereal. High yield of approx. 95% (based on wheat). High availability in continuous operation, approx. 98%. Low maintenance and low repair costs. Low wear; most consumables are readily available standard items. Simple to operate; the system runs without operator, requiring only monitoring. Presure and time curves are controlled by means of preset values for operating accuracy. The saving to memory of formulas and system parameters helps ensure consistent quality. The direct logging of production data helps you track quality. No expansion bang which means low noise emissions. No dust emission thanks to the closed circuit formed by the preheating system, the reactor and the expansion conduit. Cleaning is only required in course of product changeover or system shutdown. The expansion conduit is accessible via a large cleaning aperture for rinsing with water jet. Max. cleaning time of about 30 minutes. The preheaters and reactors are self-cleaning. The entire system is made of stainless steel with food-grade finish.